Back in the 1970s when I first started recording I was an avid reader of the trade magazine Studio Sound, which published a regular series of articles on different aspects of recording technique by well-known engineers. 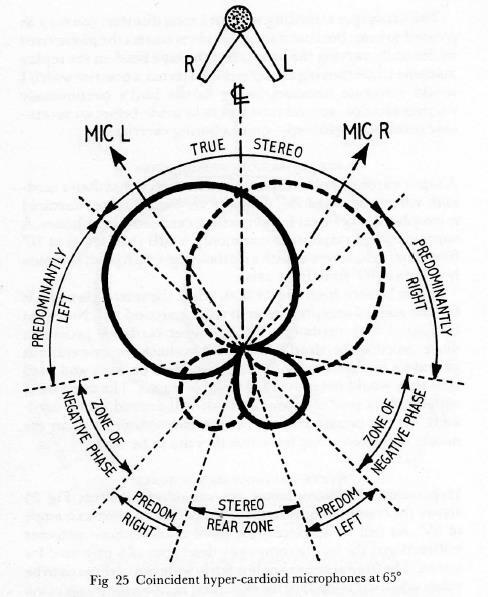 In particular I can remember reading a piece by an eminent classical engineer, (name escapes me) on co-incident microphone technique, in which he expressed a preference for crossed hypercardioids. The reason he gave was that over many years of recording he had come to the conclusion that, with its large, well-defined front lobe and small out-of-phase rear lobe, the hypercardioid polar pattern most closely resembles the manner in which the human ear picks up sound, ie. mostly from the front but with less well-defined pick-up to the rear. He therefore suggested that the choice of hypercardioid microphones produces a more ‘natural’ sound and thereby a better illusion of reality. Whatever the truth of this, more than thirty years later this technique, using a pair of hypercardioids, is still one of my favourites for recording chamber music. At any session I usually experiment with polar patterns and microphone position but very often find myself back with hypercardioid! ‘Sound Recording From Microphone To Mastertape.’ 1980. This except from my recent recording of Andrew Glover’s Flute Sonata ‘Remember’, uses a pair of AKG C414 BTLs mounted one above the other and set as described above and pictured below. 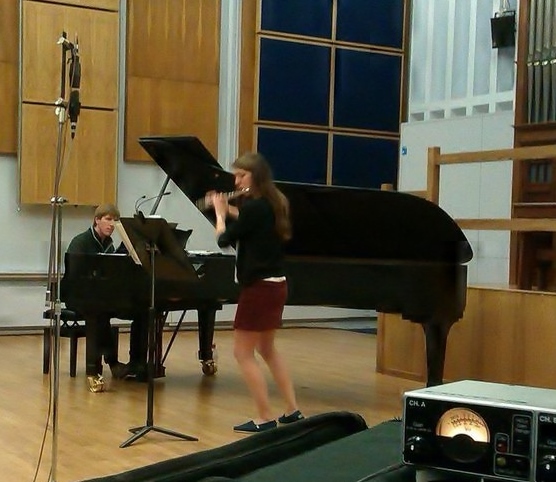 Charles Matthews & Katherine Birtles in rehearsal at Birmingham Conservatoire.